Thirteen Students Working Against Tobacco Members Graduate from Okeechobee High School! 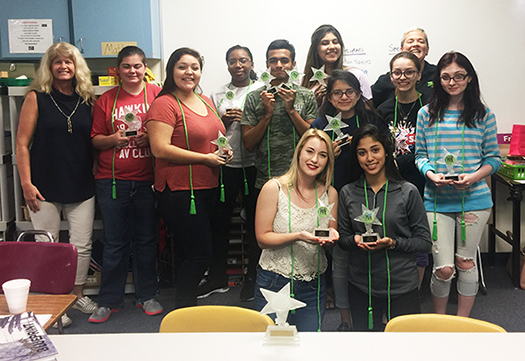 A big congratulation is in order for 13 seniors of the Okeechobee High School SWAT Club who earned a SWAT Club honor cord to wear at graduation. Seniors who qualified to earn the cord had to meet a rigorous set of expectations in order to be awarded the cord. SWAT Club uses the cords to attract new members at the beginning of each year during their club rush event. Many students join SWAT because they have parents or loved ones who are tobacco users and want to break the cycle of addiction in their family and educate other. Others join the SWAT club because they enjoy the community events and giving back to their community. SWAT (Students Working Against Tobacco) is Florida's statewide youth organization working to mobilize, educate and equip Florida youth to revolt against and de-glamorize Big Tobacco. SWAT is a united movement of empowered youth working towards a tobacco free future. Maybe you’re asking yourself, what does our club do in our community? SWAT works to change the social norms associated with tobacco. This means we want to change the way people think about tobacco… making it less desirable, less acceptable and less accessible. We do this by advocating for change in local policies that affect how tobacco is marketed, how it is sold, and where it can be used. SWAT members can expect to participate in a wide range of activities including community education and outreach, public speaking, collecting data, and media advocacy. To learn more about SWAT visit our website www.swatflorida.com or contact Courtney Moyett at cmoyett@quitdoc.com.